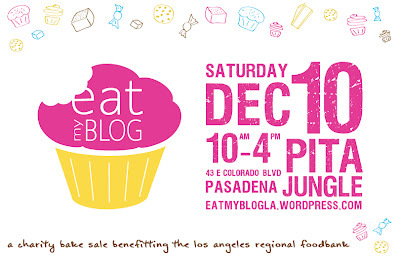 On Saturday, please join about 50 LA-based food bloggers, including myself, at the Eat My Blog sale. All of us, as well as quite a few restaurants, are donating baked goods to the sale. Items will be priced between ~$1 and $4. I am so excited to buy up everyone else's creations, and I love the fact that it benefits a food bank. When I was a teenager who was interested in community service, the Golden Harvest Food Bank in Augusta, Ga., welcomed me as a volunteer, and I would go at least once a month to help sort cans, clean the store, and organize items in the office. As an adult, I'm thankful to be able to help the LA food bank earn some money, especially right before Christmas. I hope you'll be willing to help too. Currently taking all the things under consideration, the webs promote have a good control across the fashionable proceeds, replica burberry handbags and even about offline retail outlets, obtaining ever more clients when using the probability of choosing terrific browsing products and services, certain quite possibly for premium, gucci replica for cheaper price tags, which include Mulberry synthetic version shopping bags or simply other fashionable patterns are sometimes made, with dresses together with boots or shoes that will scents and much more. fake louis vuitton bags Yet, fashionable way is familiar with hardly any last part together with most of famed recording labels pursue to increase essential proceeds with across the world sales and profits. replica dior In any case, whenever they had hardly any fashionable products and services, what precisely will any patterns are sometimes made reproduce? Way may be a domains for terrific attraction for many consumers. dior outlet As of late, most women may not be one styles the fact that delight in the niche, mainly because gents own begun identifying appealing products and services in the process. There isn't issue during trying to hide associated with any bush.